What do we know in general about dinosaur teeth? Scientists know that most dinosaurs had more teeth than humans. In addition, the dinosaurs would shed their teeth throughout their life, much like animals such as sharks do today. For example, the hadrosaurs had hundreds of teeth waiting to replace their worn out teeth. Other dinosaurs had no teeth at all, but had a beak similar to a bird, such as the ornithomimids. Some dinosaurs also had a combination of a beak and teeth. As to how their teeth were aligned, there were many differences. In humans, most of the teeth are aligned so we can chew plants; the canines represent our carnivorous past. Dinosaurs had all different kinds of alignment. 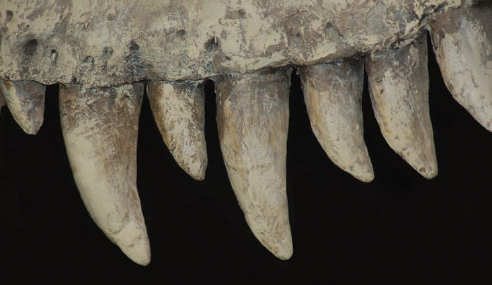 Some were similar to today’s carnivorous crocodile reptiles; others had teeth perfect for gnashing tough plants. In other words, similar to modern animals, it all depended on what the dinosaur ate. The plant-eating dinosaurs had much different teeth than carnivores, mainly because of the plants the herbivores had to eat. Meat can be readily cut up by sharp teeth, swallowed in large chunks, and digested easily in the gut. But living on a diet of plants is a much harder proposition. The cellulose found in plant tissue is much tougher than meat. Thus, plants must be cut into small pieces and thoroughly ground down by the teeth, a process that prepares the plant tissue for digestion in the gut. Once in the gut, microbes further break down the tough plant tissue in a long and rough process for the plant-eaters. In a manner similar to today’s sharks, many dinosaur species shed their teeth and grew new ones throughout their lives. Carnivorous dinosaurs had conical teeth with large gaps between them, and Tyrannosaurus rex had banana-shaped teeth with serrated edges (iStock).